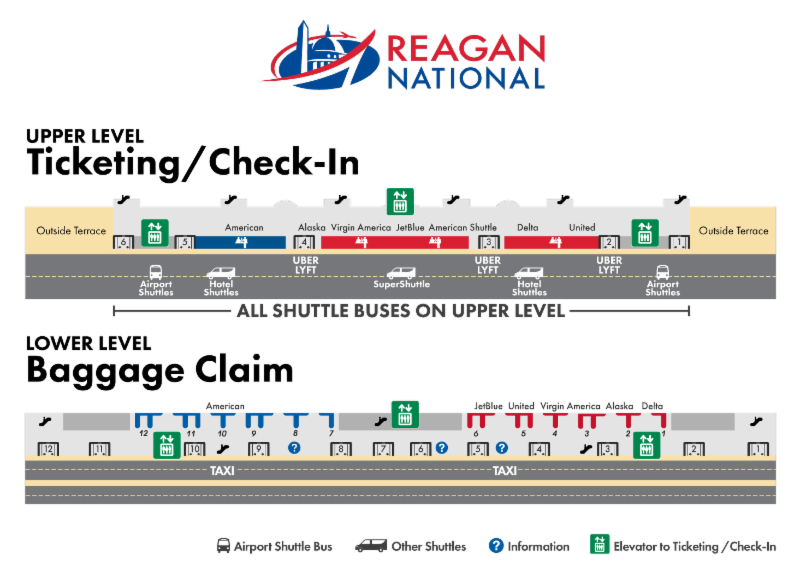 Beginning Monday, March 12, all parking, rental-car, hotel and other off-airport shuttles will pick-up and drop-off their Terminal B/C passengers only on the Ticketing (upper) level at Reagan National Airport. Passengers arriving on flights at Reagan National Gates 10-45 should proceed upstairs to Ticketing (Level 3) to ride any airport, hotel, or other off-airport shuttle. Airlines affected: Alaska, American, Delta, JetBlue, United, Virgin America. Elevator access from Baggage Claim (Level 1) is available near Bag Claims 2, 6 and 11. Follow signs inside the ticketing level and along the curb to reach the new pick-up locations for each service. Reminder: Uber/Lyft continue picking up passengers upstairs, as well. Taxis and private vehicle pick-ups will be the only ground transportation modes remaining on the lower level. Upcoming lane closures on the Arrivals (lower) roadway prompted the shift of several ground transportation services to the upper level to manage expected congestion. Shuttle service at Terminal A will not be affected by this change. The change will be effective Monday, March 12. Follow @Reagan_Airport on Twitter or subscribe to our construction alerts at flyreagan.com/projectjourney for schedule updates. When Project Journey is completed in 2021, two new 50,000-square-foot buildings with security checkpoints will replace three smaller checkpoints currently serving Terminal B/C – increasing the post-security space to include all of National Hall and its premier shops and restaurants for ticketed travelers. In addition, a new 14-gate concourse will replace Gate 35X – ending the need for travelers to ride buses to board regional jets parked outside. Concourse amenities will include jetbridges, holdrooms, concessions and an American Airlines Admirals Club lounge.